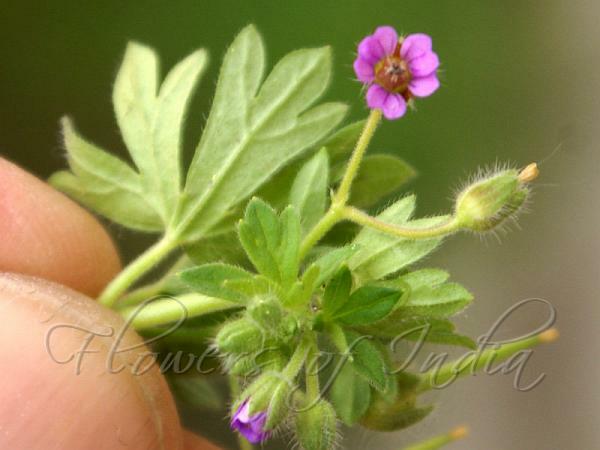 Small Geranium is a spreading slender glandular-hairy annual herb. Leaves are nearly round or kidney-shaped in outline, 1-2.8 cm across, palmately lobed into 5-7 segments. Lobes are 2-3-lobed at the tip. Stipules are 1.5-2 mm long, ovate-lanceshaped, sometimes 2-parted, hairy. Flowers are carried on 2-flowered glandular stalks. Flowers are about 4 mm broad. Bracts are ovate-lanceshaped, 1-1.5 mm long, hairy. Sepals are 1.5-3 mm long, ovate or oblong-ovate, with long margin hairs, glandular-velvety. Petals, slightly exceeding the sepals, are obovate, lilac or pink, base with sparse marginal hairs. Filament base are dilated, ciliate. Beak 6-8 is mm long, glandular-velvety. Mericarps are velvety, not wrinkled. Seed is 1.5 mm long, oblong, glabrous. 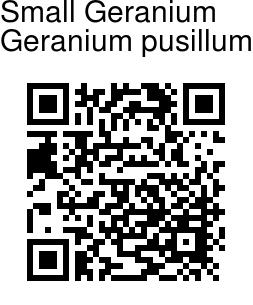 Small Geranium is widespread, and found in Europe, W. & C. Asia, Africa, Syria and W. temperate Himalaya, at altitudes of 800-2700 m. Flowering: June-July.